It is a tricky thing, making a seasonal film that will resonate not only in theaters for the few weeks it runs before Christmas but also for years to come. So, that when the holidays come around again and people begin to have that craving for holiday cheer in their home and want to watch a Christmas movie they will turn to yours as a possible option. Creating a Christmas classic, one that becomes overly familiar but never old, is tough. I have only a select few I like to turn to and I don't think I've added a new one since "Elf". 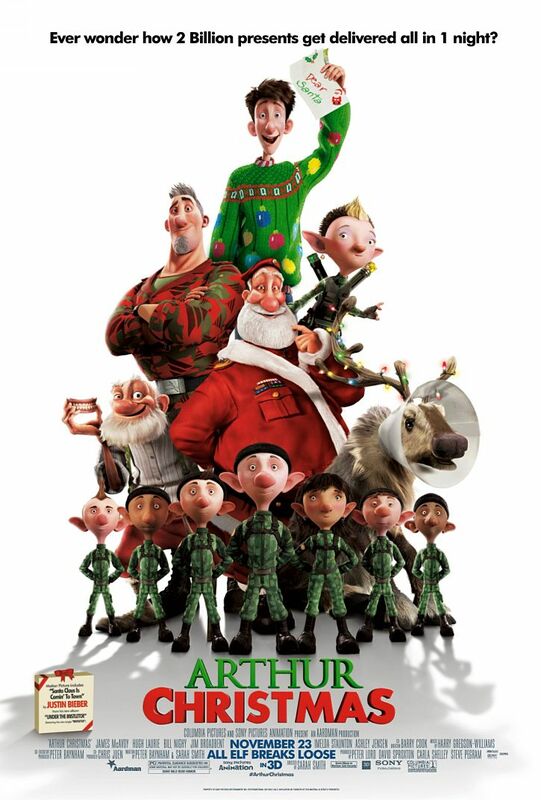 That being said I will be more than happy to add "Arthur Christmas" to my collection when it appears on blu-ray. 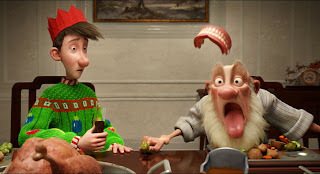 The tale of the youngest son of Santa is a breath of fresh air in terms of creativity. It re-imagines all the classical myths we have for the season and gives them a present twist that fits perfectly as a subtle lesson about how things are so rushed these days, that the true reason for the season has been lost. It is a classic Christmas tale in that sense with a heart of gold it is just smart enough to wrap those ideas in a shiny gloss that exudes wit and great storytelling. Everything we see here is in service of the story and it is sublimely funny, I don't think I heard one fart joke. The animation isn't Pixar-level but you only notice when the camera stays on a characters face for too long. It has its moments though and Aardman studios, the same guys who brought us "Chicken Run" and "Flushed Away", continues a great tradition of animated films that are expertly told stories with moments of hilarious wit. Adding a Christmas film to their canon expands their territory while giving audiences looking for quality entertainment with genuine Christmas cheer a real present this year. the gifts on Christmas night. 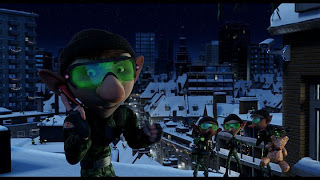 In the opening moments of "Arthur Christmas" we experience the super high tech operation that delivering all those gifts in one night has now turned into. No longer is it a simple sleigh with a bag full of endless toys but this is a full fledged military operation. Elves are dressed in camouflage with red and green berets. they are sorted into divisions and while some are deployed for the Christmas night operation others stay and work at mission control aka the North Pole. This new way of getting things done more efficiently has been designed and put into effect by the next in line for the Santa position, Steve. Steve is the current Santa's oldest son and is more prone to process than customer service. Arthur on the other hand is kept in the letter writing department as he happily responds to all the children of the world and reassuring them his dad is the greatest man in the world. Arthur is a bit prone to messing things up, leaving a trail of destruction wherever he's been, but his heart is the right place and he absolutely adores Christmas. When Steve's full proof system makes a mistake in leaving a young girl without a gift Arthur immediately finds in necessary to find a way to get it to her. Steve on the other hand doesn't see it as a possibility and their father, Santa is simply too tired to object to his eldest sons conclusion. Naturally, Arthur can't let this be and so he and Grand Santa (a riotous Bill Nighy) set out in the old sleigh to guarantee every child has a merry Christmas. As voiced by the charismatic James McAvoy (Wanted, X-Men: First Class) Arthur is a loveable goof. He is every bit the enthusiast others make fun of him for being but he is not an idiot. He is self-aware and understands the dynamics of his family better than anyone else seems to. 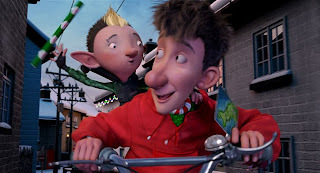 That is what "Arthur Christmas" indeed boils down to (as so many great Christmas films do): the comedy and relatability of a dysfunctional family. GrandSanta doesn't understand the new generations way of doing things when he got them done just fine his way. Steve doesn't understand why his father has not passed on the torch yet; he is already running the show, he might as well have the title. Mrs. Santa has stood by her entire life watching her husband be Santa instead of the man she probably first fell in love with and is no doubt eager to spend some time with a retired Santa as well. Arthur, the clear underdog just wants to be a part of the great tradition his family carries on. He wants to continue to spread the joy and forget all of the politics of who's rightly Santa and what methods are used to deliver the gifts. He just wants to make sure every child has a present from Santa on Christmas morning. This is where the film shines too, getting exactly right not just the dynamics between family members but the relationships that actually have to be carried out. The interaction between Santa's clan here is completely believable and lends the film its cleverness in delivering an age old lesson in a time of well oiled machines. gift that got the left behind. I can remember watching Tim Allen in "The Santa Clause" when I was younger and being completely enthralled with the experience of getting to see the behind the scenes action of how Christmas came together. I can only imagine "Arthur Christmas" will do the same for an audience that has never seen it spelled out on screen but always had the imagination to wonder. Even myself, as a 24-year old, sat in amazement in those first ten minutes or so as the city-size airship came over Germany and dispersed thousands of elves as if they were in a Mission Impossible film to deck the halls and deliver the gifts. It was thrilling and completely original. Creativity is what makes any film thrive, but especially animated ones and that particular trait is on full display throughout "Arthur Christmas". Whether it be the way elves fill stockings or even how Santa and his helpers escape a "waker". All of it is brilliantly executed with a charming title character and side kick in the form of an expert gift-wrapping elf Bryony (Ashley Jensen). Her and Arthur form a team the kiddies will love and the parents in the audience will enjoy the tone and lessons of the film while being transported back to their childhood state of mind as well.